When I was running a large but young product development team, folks would often come to me worried about some piece of news. Perhaps someone had been promoted, or resigned, or the company had announced a re-org. It was all worrying to young employees without too much corporate mileage under their belts. Did it help? I’ve no idea, but I often think of the surfing analogy with respect to Product Management. If anyone in an organization can ride out change, surely it must be Product Managers. Not only do they need to be agile and adept at spotting the big rollers, but in taming them to help drive the organization to a more profitable future. After all, to a Product Manager, change should represent opportunity and the first to spot it and make the best use of it will make the most profit from it. Just knowing a good beach is not good enough though. Some beaches will be good some days, and not others. In fact it is part of their role to seek out the beaches with the gnarliest waves on any particular day. Markets are like that: they are constantly changing and the opportunities they represent change with environmental factors. Each day is different. We have to look at things afresh, judge the conditions, and make some educated guesses about where our organisation’s best opportunities now lie. 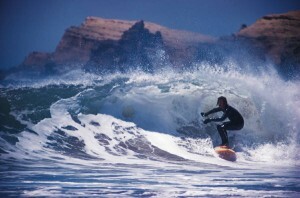 You can’t go surfing without getting wet, and so it is with Product Management. You have to go and immerse yourself in the market, start making decisions about which wave to ride and whether it will break left or right. Then you have to get up on your board and actually surf. Commit to a particular course of action and timing. Surfing requires great skill, awareness of the water and its movement, of the board and your weight. Constant minor adjustments of pressure are necessary to keep upright and moving, often you’ll have to change direction just to keep on the wave. So it is with products, we must constantly adjust, check the conditions and adjust some more. Then when we finally reach the beach, some sort of conclusion, whether it is product launch, or end-of-life, we, the Product Managers, have to pick up our boards and go back into the water… everybody’s surfing now. This entry was posted in listen and tagged fun, innovation, product management. Bookmark the permalink. This is a great article. I grew up surfing on the California Central Coast and always draw this analogy. On a big day, you have to be in shape so you can paddle out, and have good reactions to catch and ride the best waves. You need a finely tuned intuition. Likewise, when you’re pushing a program, you have to have your research tight, so you can answer any question, and be prepared with contingencies for difficult developments. Most importantly, you have to know your break, so you can be positioned when the set waves come. Thanks for the comment JC. The fun of the analogy has been completely overwhelmed by the terrible events in Japan. My thoughts are with my friends and colleagues over there.